Cindy Brouillette is the clear trendsetter in Northern Kentucky real estate marketing, as few REALTORS® can match Cindy’s marketing education, professional experience and innate instincts that separate her from peers, both locally and nationally. 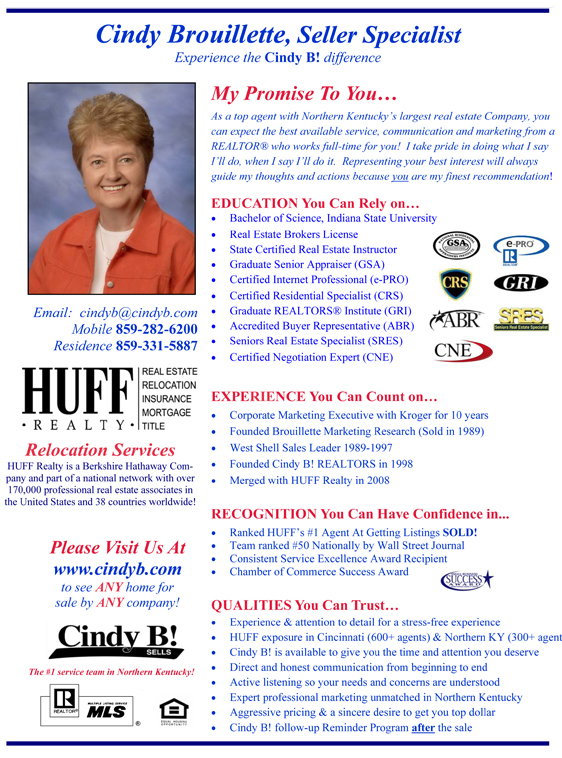 If there is a new real estate strategy or marketing technique being used in Northern Kentucky, you can be reasonably assured that Cindy Brouillette was the originator. Cindy is personally involved in the marketing of each Cindy B! listing. While her most powerful marketing techniques are too confidential to publish, her sellers enjoy creative positioning and maximum exposure in the following media. All of Cindy B! listings are made available to over 1,200 cooperating REALTORS® from other Companies through submission to the Northern Kentucky Multiple Listing Service (MLS) and www.nkmls.com. Because Cindy B! knows your home best, she inputs her ;own listing details into the MLS to insure accuracy, completeness, creativity and the quickest exposure possible for Cindy B! sellers. Cindy along with Huff Realty® participates with other real estate companies in Greater Cincinnati & Northern Kentucky in offering Broker Reciprocity, an agreement between brokers allowing them to post their MLS listings on each other's web sites. While all Northern Kentucky listings appear on www.cindyb.com, sellers who list with Cindy will also see their homes listed on the web site of other brokers, including Sibcy Cline, Coldwell Banker West Shell, Keller Williams, Re/Max, Star One, Realty Executives, Etc. "Staging" was pioneered locally by Cindy in the early 1990's and is becoming more and more important to sellers in search of a competitive advantage. Why spend hundreds of dollars paying "Professional Staging Consultants" when Home Preparation Coaching is a FREE professional service provided by your Seller Only Specialist with Cindy B!? Known as the marketing expert that sells real estate, over 33% of Cindy B! listing sales are homes that had been previously listed with another company! Considered the leader in Internet real estate marketing, enjoy maximum creativity & expert positioning in exposing your home to local and out of town buyers on a variety of local and national real estate sites. Cindy’s Internet listings show interior and exterior photos and are featured nationally on www.realtor.com with 2.1 million unique users per month. Additional photos and property details are frequently e-mailed to potential buyers we communicate with daily about our listings. Many relocation buyers are directed to Cindy through her memberships in a variety of national referral networks and from other top-selling agents across the nation. 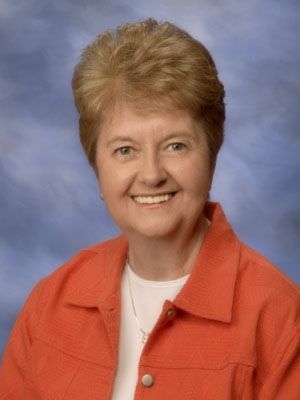 As a member of Leading Real Estate Companies of the World, The Employee Relocation Council, & Greater Cincinnati Relocation Council, the Cindy B! referral network has more offices than any national franchise! Cindy B! has an enormous customer bases and this translates into an unlimited number of potential buyers for your home. Because of high client-satisfaction, there are over 4,000 Cindy B! past clients actively recommending us to friends, family, neighbors and work associates! With over 25 local and national articles published about Cindy B!, high-visibility and a positive image within the community also translates into a regular stream of client referrals and potential buyers for your home. Cindy B! has unlimited access to buyers! To increase the pool of buyers within the market, Cindy B! buyer agents prospect daily in an effort to locate buyers for her listings. Cindy’s buyer agents have the time to focus on activities that make a difference in getting your home sold quickly and for top dollar! Whether it’s in The Real Estate Book or other publications, buyers appreciate that all of Cindy’s listings show the price and address because this is key information that buyers want to know. Because buyers trust Cindy’s honest approach, they are more likely to call her to see her listings as well as other homes advertised by other Companies. With Cindy B!, there's always an Agent on Call so buyers have access to experienced and highly-skilled Accredited "Buyer Only" Specialists for showings or no wait listing details 7 days a week until 9 PM. Why chase a listing agent, leave voice mails or talk with newer agents and lower performers who rotate phone time to generate business when a live agent is always available at Cindy B! 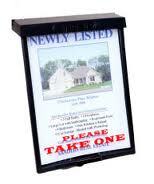 There are times when brochure boxes work to a seller's advantage in selling and times when they could be a disadvantage. Cindy B! knows the difference. She will advise you and make a recommendation on whether or not one of our brochure boxes would benefit you!